Three times in his speech President Bush (the first one) recited that now familiar phrase 'new world order.' ...the trouble is that order is a 19th century concept. It suggests Metternichian arrangements of large, heavy, somewhat static entities. History in the late 20th century seems to belong more to chaos theory and particle physics and fractals; it moves by bizarre accelerations and illogics, by deconstructions and bursts of light." Most people are understandably frightened by the daily headline connotations of the word chaos, used synonymously with disorder and disruption. This is not what the science dubbed "chaos theory" is about, and there is not any one theory to it - any more than there is one theory to physics or biology. Chaos theory explains how a rainforest achieves stability and balance without anybody centrally programming what grows where and why. It shows us that the wild chaos of the rainforest, with no imposed control, manages to succeed as a 'happy' rainforest - unless bulldozed, usually with the aid of state subsidies. Chaos theory defines a new attitude to the world that science studies. |It has created and stimulated many new branches of science called complexity theory, anti-chaos theory, co-chaos, dynamical systems theory, non-linear dynamics and other less provocative titles. Chaos theory has enabled the existing sciences - whether biology, geology or physics - to look at the wholeness of their subject rather than just smaller and smaller subsections of it. Chaos theory also explains why the synchronicity that so often astounds us in life is, indeed, just another manifestation of the patterned web that connects our universe together. This book refers to chaos theory and specifically to the implications it has for our approach to the management of our own affairs. However, most of it will ring true to your own experience of life, whether or not science had ever discovered the patterned dynamics that self-organize within a complex system. Though a small library has been written on the multiplying dimensions of this new science, there appear to be few scientists who have looked through its lenses at the way in which we deterministically run our society. Scientists must be wary of lost funding and the potential career damage that can result from straying into areas not traditionally considered to be the province of science. The most ardent proponents of chaos theory will rightly explain the linkage between today's hurricane and a butterfly's wing flap in Guatemala six months ago. Yet few of them would even consider, for instance, that something with the power to lift the very oceans, or the positions of our neighbours in the solar system, including the Sun, might have any effect upon the development of a delicate foetus. Astrology is taboo, as is any scientific look at subjects falling into the vaguer areas of social organization and politics. Social science is a dirty word to most pure scientists, and its not surprising when you consider some of the appalling things that have been done in its name (i.e. Karl Marx). Perhaps as a result, there has been little application of this new science to the study of social organization. Yet the implications of chaos theory for the way in which we govern our society ultimately hold the greatest benefits for us all, and are the ones that could take the longest for science to explore. The origins of this science, spawned in the 1970's, are briefly explored here, but it is not the purpose of this book to dazzle you with all the implications of its growing usage in image compression, financial forecasting, mineral prospecting, medicine, image creation, traffic flow dynamics, data encryption and so on. Suffice it to say here that chaos theory has given scientists the tools and understanding needed to see what is happening in a far bigger picture than they could ever see before. There are many benefits of this already becoming manifest. The focus of this short book is on us, all of us together, for we are all part of a complex system in which anything affects everything. We will look at the usual world in a different way, forgetting for a moment much of what we have always taken for granted. The human race has not been on this planet nearly long enough for anyone to seriously argue that something must be a done a certain way, "because that's the way it's always been done." We have existed for less than 5% of the time-span that the dinosaurs lived on earth, and have just discovered a science that clearly shows why our short and probably recent experimentation with different coercive structures and techniques through which to rule society, has not yielded a long-term* successful formula yet. *By "long-term" I simply mean something which goes on working and adapts to changing circumstances and, if replaced, is done so by an improved version. There is no E= mc2 type of equation to sum up the essence of chaos theory, though the formula most likely to be identified with it is the elegantly simple one which reveals the infinite world of the Mandelbrot set: Z = z2+c. The discovery of chaos theory has given science the tools and the inclination to study the overall patterns and the form of the phenomena being studied, with less emphasis on reducing the subject into smaller and smaller pieces in which are found even smaller bits. Believe it or not, science has discovered the concept of the whole! In pre-Babylonian times Chaos was perceived as the mysterious space between Heaven and Earth, and the source of inspiration, form and change in this world. Surprisingly, this is closer to today's scientific usage of the word than that in the newspapers. The quantum shift to a deterministic attitude, and the belief that man had dominance over the earth, appears to have taken place around 2000 BC for most of the emerging civilizations we know about today - our approximate period of recorded history. This shift is classically depicted in the Babylonian myth in which Marduk, symbol of man's control, kills Tiamet, the dragon goddess of Chaos. This is the same earth dragon spirit that represents the organized forces of nature in many early belief systems from Chinese to pagan. Though many tribal and pagan religions since Babylonian times have recognized a more holistic partnership with the earth, most of the world's diverse major religions and cultures have viewed earth as something over which they claim domain and ownership rights. The legend of St. George killing the dragon (symbol of the chaotically unpredictable energy of the earth), is simply a continuation of the misguided affirmation, which took root just four thousand years ago; that mankind is able to control the chaos and shape culture by force, according to his own preconceived order. As we will see, the power of chaos that we naturally harness to change our world is demonstrated in virtually all of the achievements of civilization and technology that we treasure. Yet where the chaos is determinedly forced by us, as would-be masters of the earth, the resultant product usually creates more misery for our species. The discoveries of chaos theory have firmly removed the basis for centuries of deterministic thinking both in science and in government. The societies that we form in this world can no longer be viewed as if they were giant and very complicated machines that need a control structure of ever increasing complexity in order to be successfully managed. The secret of nature's most complex structures is in the simple techniques by which they are built and managed, combining a simple repetitive act with the strangely helpful chaos of unpredictability, in order to make their growth and evolution in this world successful. The networks of nature consist of an infinite number of components acting as feedback loops into the whole. Each component is constantly feeding information and activity into the system and modulating its own behaviour according to the whole system's activity. This new science of chaos has a more holistic view of the world and a recognition of the apparently universal tendency of complex systems to create order within themselves - to exhibit what is termed "self-or zation." The capacity of the world to create harmony on its own, to create a pattern within a multitude of events, is one that has been glimpsed by mystics, artists and assorted individuals from time immemorial. Scientists now recognise it too, and in the next century the importance of these new discoveries will eclipse even those of relativity and quantum mechanics. Scientists can now witness this harmony of self-organization and recreate it using fractal geometry on a computer - which led to these mathematical fractals being dubbed the "Thumbprint of God." The mathematical fractal discoveries were a by-product of mathematician Benoit Mandelbrot's determination to discover the geometry of the repetitive patterns that he recognized in nature. Often for the first time, this fractal mathematics gave scientists in other fields the tools they needed to look at the patterns and forms of their subjects. Mandelbrot was frustrated by the inability of Euclidean geometry to measure natural forms like mountains, clouds and trees. They are made up neither of circles, rectangles, triangles nor straight lines, yet the Latin roots of 'geo-metry' mean measurement of the earth. 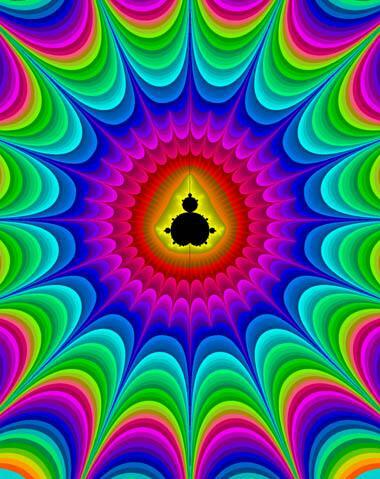 Mandelbrot has a particularly perceptive pair of eyes and enjoys using them and acknowledging their inputs. This is not a very 'scientific' thing to do - the human eye, as science's dispassionate observer, was meant to record data, not to make insightful observations. Benoit's eyes could see the repetitive geometry that made up a tree, a bank of clouds or a range or mountains. He saw the formula of the clouds before he was able to mathematically describe it with numbers and letters. It was after he started work on the fractal geometry of nature that he was led to further research of the near-abandoned work of two unusual French mathematicians from 1918-1919 (Julia and Fatou). He studied the non-linear formulae they worked with and, in an attempt to map them out, discovered (in 1980) the now famous Mandelbrot set - the strangest beast ever found through mathematics. When you understand fractals you understand that they are no more computer generated than is a photograph generated by a camera. The Mandelbrot set and other fractals exist through the repeatable but unexpected, unpredictable and inexplicable organization of points on a piece of paper. The computer simply enables us to see a representation of how these individual points* have behaved when struck with a formula. In much the same way a camera will show us how each light beam behaved when it touched the identical grains of film. Neither the computer nor the formula actually create the fractal image. It is done by the process of iteration, of repeating the same process over and over with a very slight modification each time it is done. That same powerful process is the key to meditation, to chanting of mantras or Hail Marys and to the pure fractal images that can be derived through constant feedback to a video camera of its own starting image. *The points are simply those points on the page or computer screen, which have been assigned the value of the co-ordinates of their location on the x,y graph of that page. Zoom into the Mandelbrot set-final frame magnification is 17.6 trillion. Scientists now recognize patterns of self-organization in far more exciting areas than the dots on a blank computer screen. They are becoming aware of a universe composed of interlinking sub and super-levels of organization such as that which exists within the random neural network of our own brains and within the self-regulating phenomena that keep this earth's atmosphere within those very narrow and seemingly precarious parameters necessary for life. James Lovelock was the first scientist to recognize our earth itself as a whole living organism, consisting of an infinity of interconnected components. One of the other great discoveries of chaos theory is that called "sensitive dependence on initial conditions." This is commonly known as the "Butterfly Effect," the recognition by Edward Lorenz that something as insignificant as a butterfly flapping its wings in, say, Ecuador could make the difference between a rainstorm or a hurricane many months later and thousands of miles away. The "initial" in "initial conditions" is any point in time and space you choose. Future generations may find it hard to comprehend the arrogance of our scientific cultural base that was set to be turned around in 1961 when Edward Lorenz took a numeric short-cut that led him to an unexpected new destination. That serendipitous diversion triggered the discovery that in a non-linear system simulating the weather, a seemingly insignificant change in local wind speed equivalent to that caused by a passing butterfly's wing flap (say a hundreth of a m.p.h. in a few cubic inches area of air) will, some months or years down the weather system, result in a completely different outcome to the total system. The butterfly didn't actually cause or trigger anything. The discovery was that a most seemingly insignificant part of a system can can have a profound effect upon its future. If the significance of a mere butterfly's wingflap is hard to swallow, let me give you an easier example. There are many in your own life that you will recall and many more that you do not even recognise. Something as insignificant as a pause to pass wind can make you miss a bus, whereby you meet someone at the bus stop and strike up a conversation - the script can go anywhere from here but that conversation could change your career, get you married or just trigger you to go see a movie which will change in subtle ways your reactions and relationships with the world thereafter. Every input and output, however insignificant, affects not only your life but also the future of the world in some small way, and often quite dramatically in a seemingly unrelated way. The butterfly of chaos theory has made a nonsense of all the linear projections of politicians, economists and their ilk. In today's ever more complex world, that which changes history is rarely predicted - the great stock market crash of 1929, the collapse of the Berlin Wall, the Gulf War, Mad Cow Disease. Even in the aftermath of these events, there is rarely any perception of the eventual changes and consequences of the event. On more mundane matters, as well, the forecasts and projections of the 'experts' are often completely out of touch with the actual reality, whether we are looking at weather or economic statistics. What chaos theory proves, which may now seem self-evident to you, is that even if the weather forecasters had one million non-invasive data inputs per cubic millimetre of planet earth, accurate to a hundred decimal places, they would still not be able to forecast exactly when it might rain in a few days time. All they can hope for is that it all goes as it has in previous years, following established trends and averages. Hurricane? What hurricane? Mad Cows? We're perfectly sane! Science has, for many years, worked on the principle that if you had enough data available you would be able to get the weather absolutely right. In the late 1950's it was readily believed that, as we increased our knowledge of weather systems and our chemical and technical ability, we would ultimately gain some rudimentary control over the weather of the world. The ingrained principle of determinism which led to such fanciful thinking has now been firmly overturned in the world of science. The state has, for many years, been firmly run on the equally unsupportable principle that with enough data and sufficient force applied in the right places, it can not only accurately predict the course of society, but actually direct and manipulate it at will. We now are faced with the evidence that it is not possible to achieve this objective through the forcing of some parts of a complex system and have centuries of experience of the state's manipulations going wrong. Yet many of us still hang onto the hope that some day they will find a way to successfully shape society to their plans. There is no reason to suppose that human society, alone in the universe, is somehow exempt from the rules that govern the development of complex systems. "Every time the government attempts to handle our affairs, it costs more and the results are worse than if we had handled them ourselves." We do not get government through the hapless attempts of the state to forcibly control and shape society. We get instead a counter-evolutionary interference in the development of the self-governing structures that our complex society would otherwise produce. This process is always at our cost and usually to our cost, that is to say we pay the bills and we suffer the consequences. Many of these self-governing structures already do exist in our society and flow so smoothly that we do not even recognize them. Like the fractal patterns of the natural world, our own society has an invisible order and pattern to it that is not superimposed from above, but created by a network of freely operating interdependent systems. Many of these self-governing structures have been developed over the course of many generations, changing and adapting to a changing society. Whilst the components of these structures may be subject to some forced interface with the state (see Ch.20 The State of Business) the pattern of this system is largely self-organized. We are not aware, nor have we needed to be, of the invisible structure that combines to feed a large city on a daily basis, nor of the multi-layered systems that permeate our society to ensure that we are clothed, fed, read, entertained and usually able to find a hot drink at a cafe somewhere not too far from our home. When the state directs things we call it government, but when we let it happen by itself with no fuss or mess we don't call it anything. We do not even see a problem when we already have the solution in place. Chaos theory now recognizes the patterns that evolve in complex systems. Chaos theory shows us how the severed feedback loop between the state and its 'clientele' prevents the state from effectively governing society. Instead of governing society, the state seeks to dictate and enforce the conditions that it thinks to be 'best' for society in some general sense.